Place the steaks onto a grill pan. Dot with 15g (half an oz) butter and season. Cook under a preheated grill for 8-10 minutes, turning once. Meanwhile, prepare the sauce: heat the remaining butter in a pan and add the champagne. Bring to the boil and reduce the liquid by half. Stir in the cream, seasoning and chives. 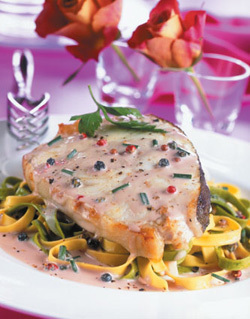 Arrange the halibut steaks onto a plate, pour over the sauce and serve on a bed of cooked green and white tagliatelle.